There are things which are game changer in the world of software development: one such event was when I started using a VCS (Version Control System): it changed for me how I keep and store my projects and settings. It even changed the way how I deal with non-software related items like documents or other valuable things: I started storing them in to a VCS too. In a nutshell: a VCS is a data base or a system which allows me to store and retrieve files. It keeps a history and I can go back in time to retrieve an earlier state or compare different states. It ‘versions’ items or files in a kind of data base. In most cases such a data base is used by multiple users or developers, and with this the system is able to ‘merge’ changes of different developers: it keeps an audit track and backup of all the changes. Not using a VCS for any medium or larger scale project especially with multiple developers collaborating sounds like suicide to me. If you never have used a version control system, you probably want to start using one. 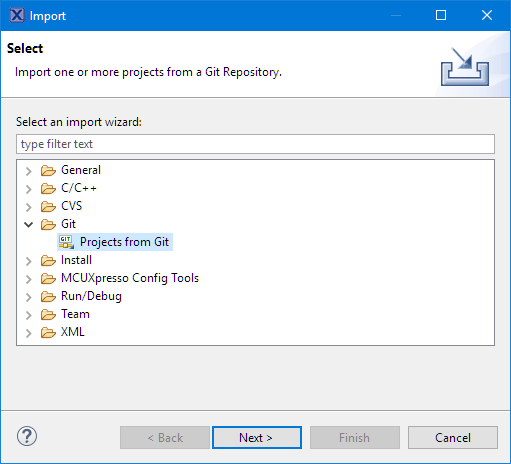 I have used different VCS (cvs, svn, git), and while I still keep projects for historical reasons in vcs and svn, I’m using git for all my new stuff. By default, there is always a local repository. 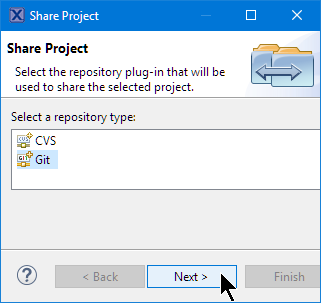 A remote repository is needed to share something, e.g. on GitHub. git config --global user.email "john.doe@company.com"
That all what we need for configuration. which creates the repository with that name after the ‘init’. 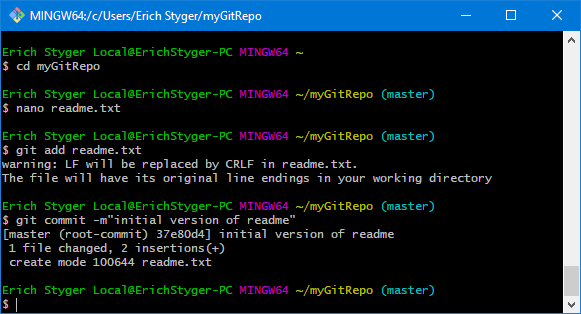 git commit -m"initial version of readme"
My preference for an Eclipse plugin is ‘EGit‘, for which I wrote an article how to install it into CodeWarrior. 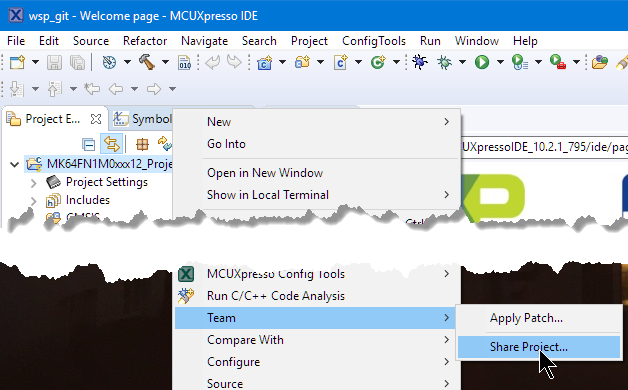 Many Eclipse distributions already come with a git client pre-installed, and the NXP MCUXpresso IDE comes with EGit too. 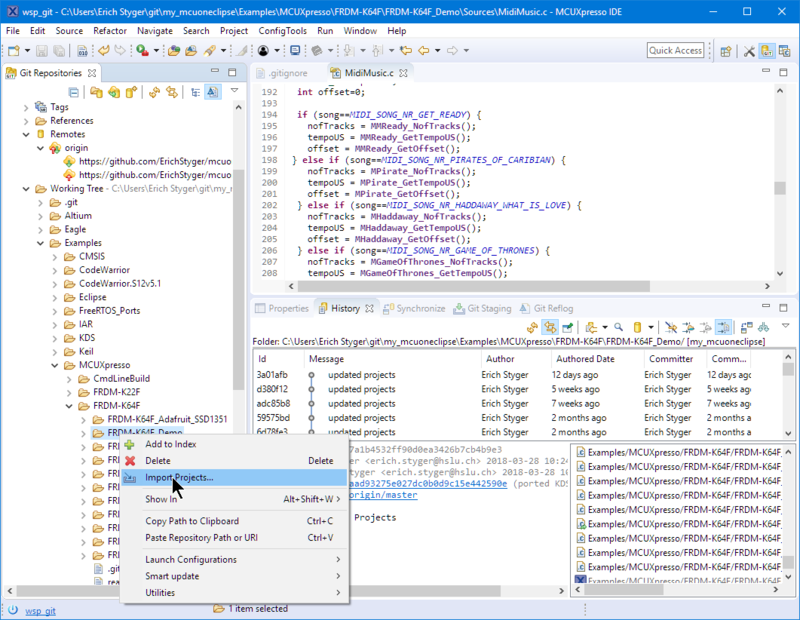 Going forward, I will show how to use Eclipse (NXP MCUXpresso IDE 10.2) with EGit. 💡 You won’t have access rights to push to that repository on GitHub. 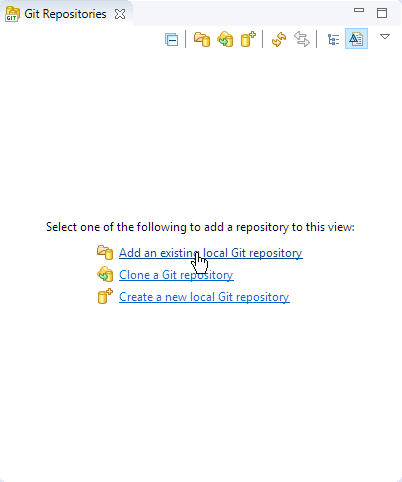 If you want to make changes to a GitHub repository: Clone it on GitHub to your own list of repository and use your repository URL. 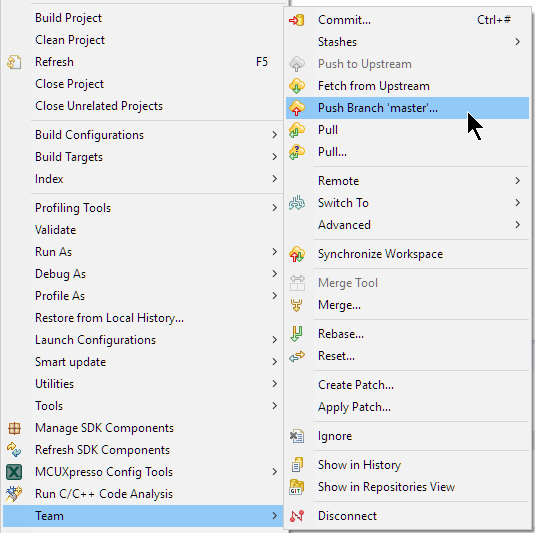 Press next and select the desired branch (if any). Press Finish and it will download repository content which might take a while depending on the data in the repository. 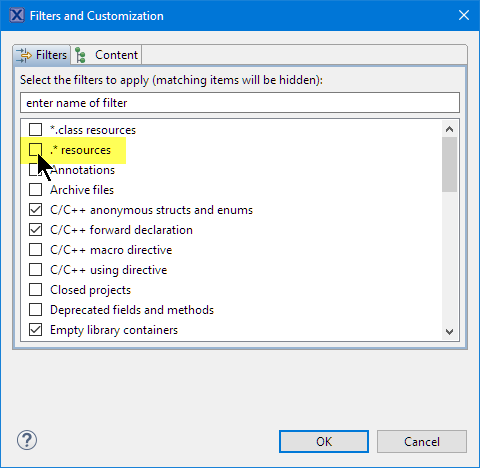 Git uses the file .gitignore to filter (hide) files or folders which should not end up in the repository. The file is processed from the top to the bottom, with # used to start a comment line. As a general rule: ignore everything which is derived or generated as it would easily create conflicts in the repository. 💡 For a list of things to be ignored for CodeWarrior and Processor Expert see https://mcuoneclipse.com/2013/03/29/version-control-with-processor-expert-projects/. Update: It is recommended to ignore the .settings folder of the project (see discussions in the comments section of this article). 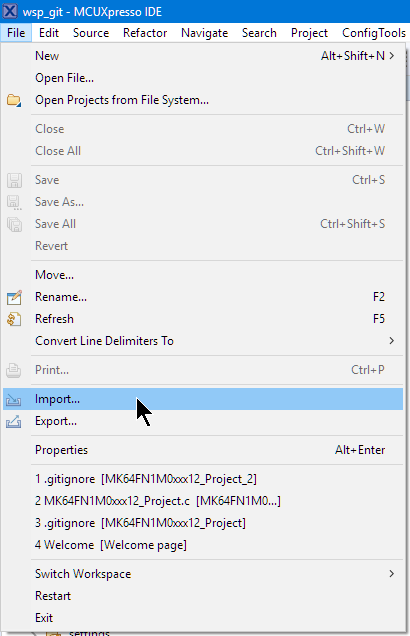 The .settings folder contains XML files with local plugin settings and are specific to the user. So do not put that folder into the version control system. 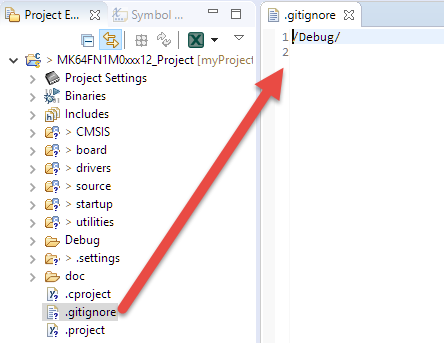 For MCUXpresso IDE and SDK projects it is very simple: only the output folder with the generated make and object files needs to be ignored which is usually named ‘Debug‘ and/or ‘Release‘. As seen from the above .gitignore, Eclipse already added this to the list, so we are fine :-). Then I can commit (make the change in the local repository and push later) or do a commit with a push to the remote repository. 💡 I prefer to make smaller commits and then push them later. With a local (not shared) repository a push is not needed/possible as the push is to the remote repository. 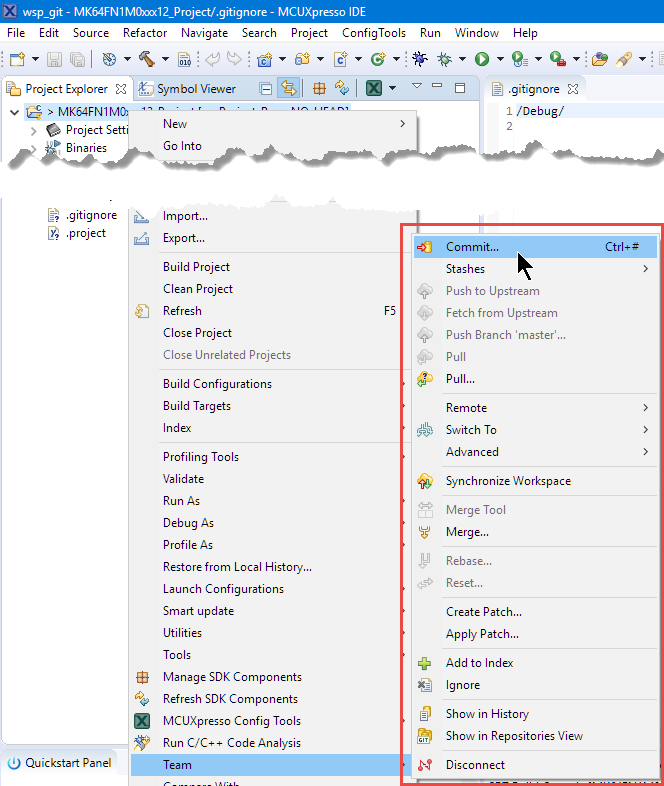 In the same menu I find the pull actions (to get the changes from the repository. That way I can easily import projects from any repository :-). 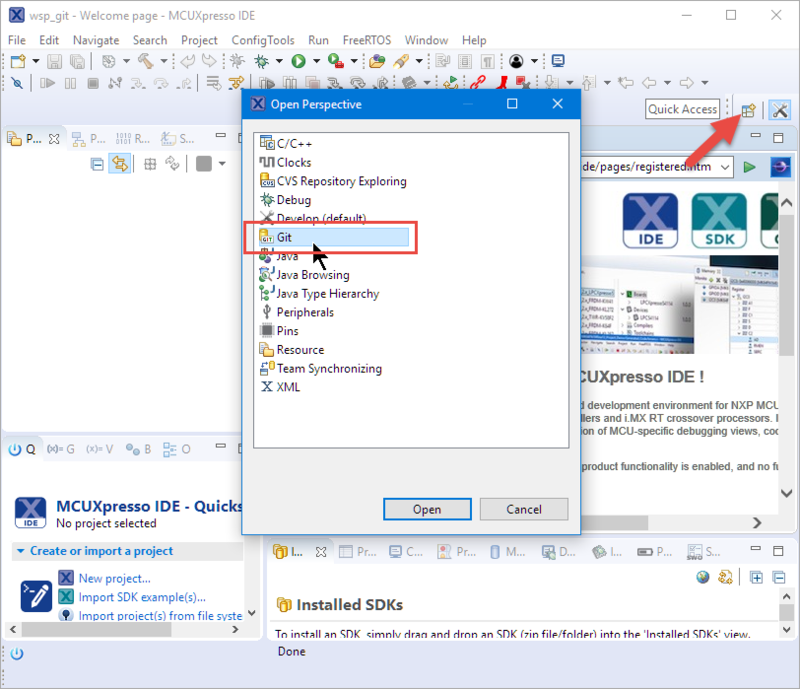 This entry was posted in CodeWarrior, Eclipse, Embedded, MCUXpresso, MCUXpresso IDE, MCUXpresso SDK, NXP, S32 Design Studio, S32DS, Tips & Tricks, Tutorial and tagged Building, Eclipse, EGit, git, GitHub, NXP, open source projects, Processor Expert, software project, technology, Tips&Tricks, Tutorial by Erich Styger. Bookmark the permalink. 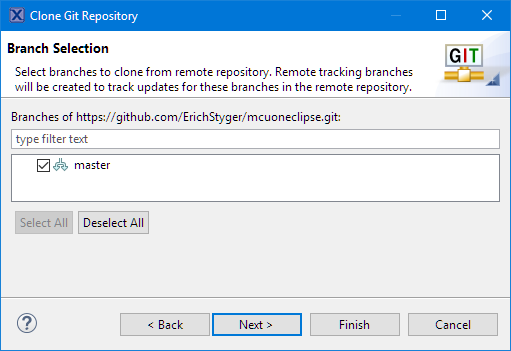 I know that this is a blog about Eclipse, but anway… I gave up using the Eclipse Git plug-ins long time ago, in favour of the separate Git client SourceTree (https://www.sourcetreeapp.com). The Mac version is probably the best Git GUI client available. 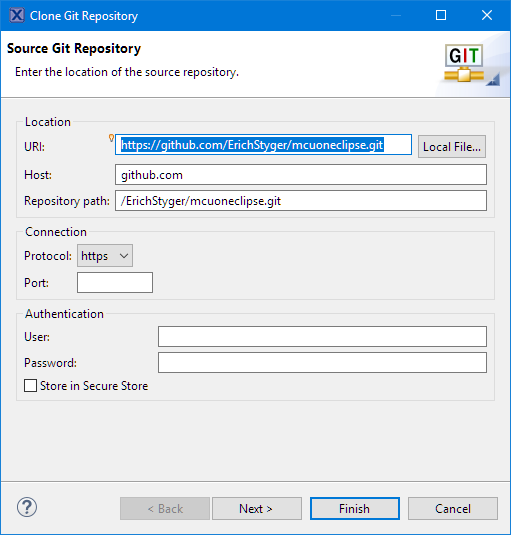 My main complaint about the Eclipse Git plug-ins was that they tried (at least in the beginning, when I evaluated them) to behave somehow similar to the SVN plug-ins, which is confusing, Git is really different from SVN. 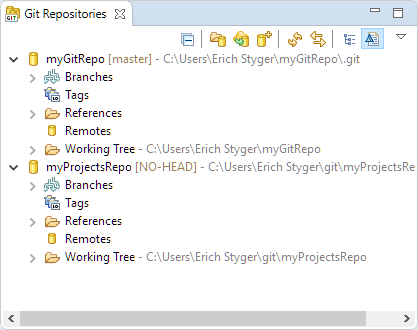 yes, me too: I’m using SourceTree for all the general Git work. 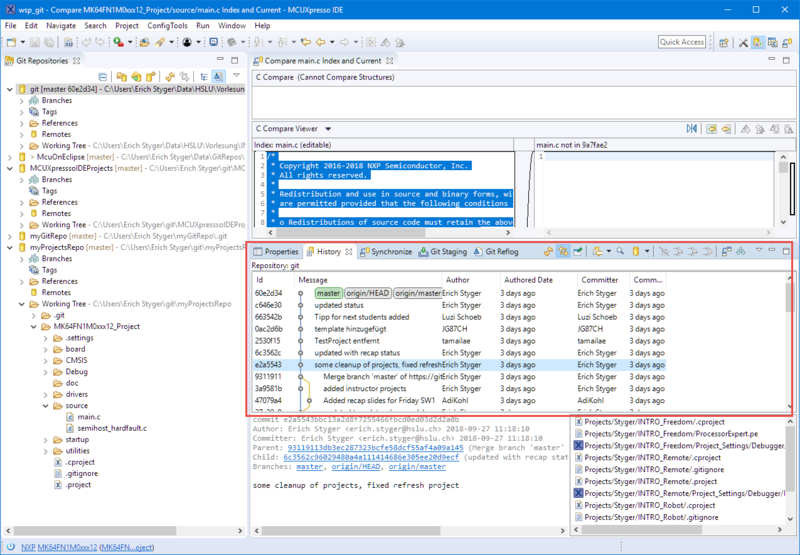 Still the EGit plugin is handy to work within the Eclipse flow, but is not a replacement for a GUI client like SourceTree. I have used SVN a lot in the past, and I agree that early version of EGit had inherited some of that, but the current plugin is reasonable in my view. 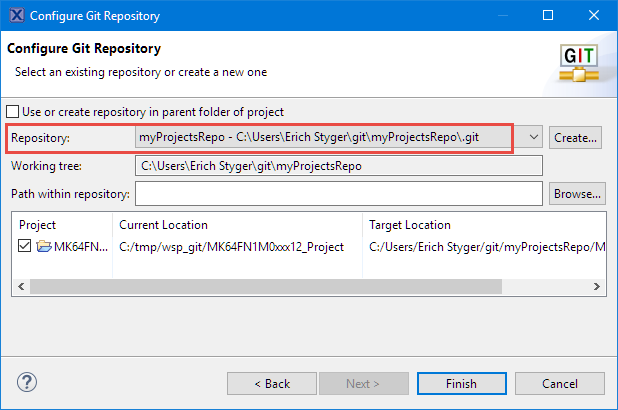 Once you commit a project to the remote repository, can you delete the local files? Yes, but this means deleting it from your local copy, which means you won’t have it available any more e.g. to edit/build. The files remain in the remote repository, and if you do a pull the files will be restored on your local copy/disk. A confusing thing for me is still which files to check-in. 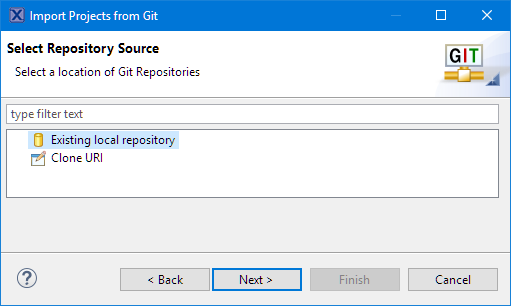 Ideally you want _all_ project settings to be part of the git archive, for other developers to re-use, or to have them available when making multiple clones when working on different branches/features/bugs in parallel. But I have seen SDK Eclipse example projects that have a .settings directory as part of the project structure; not sure yet if this gets copied to the Eclipse workspace when importing. Perhaps there are more relevant files like this to be reused between developers (editor settings, highlighting settings, perspectives, cached index when large, …)? 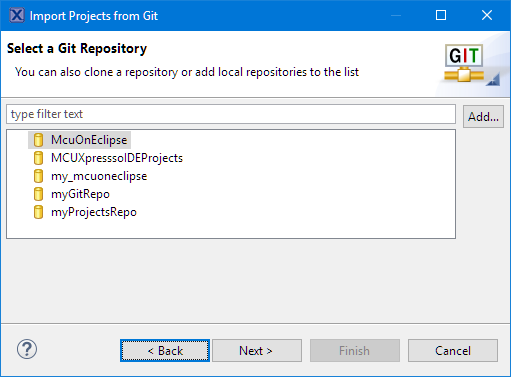 In most case I’ve seen external make file projects (for automation purposes), in git, developing using Eclipse. How do other people do this (efficiently)? Custom wrapper scripts that create/modify the whole Eclipse workspace structure and start-up sequence does not seem the way to go. 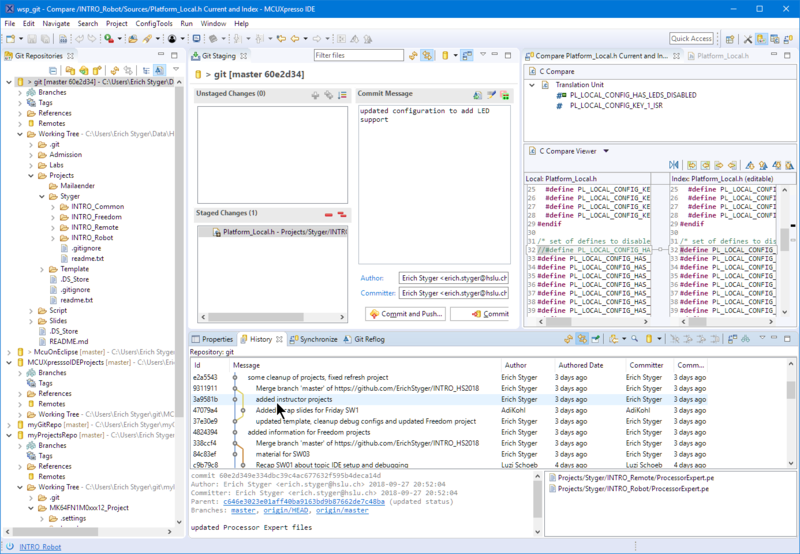 Ideally you want the features of Eclipse (debugger, assembly, etc. ), with the speed and efficiency of a small editor/mini IDE like geany (www.geany.org). You absolutely want the .project and .cproject files in the repository. The .gitgnore as well as it describes what to ignore. This has nothing to do with the Indexer thing: the indexer data is stored in the .metadata folder of the workspace, and that folder *never* should be in a version control system. The .settings directory in the project is debatable in my view: Usually I don’t store it as currently there is nothing of value and if I have a project imported without that .settings folder, things get recreated. But if you want to put it into the repository, why not. You can use external make files for the build, but this is rather a pain in my view. It is much easier to use the IDE in command line mode to build things, at least in a smaller scale. For larger scale systems it makes sense to use make files. 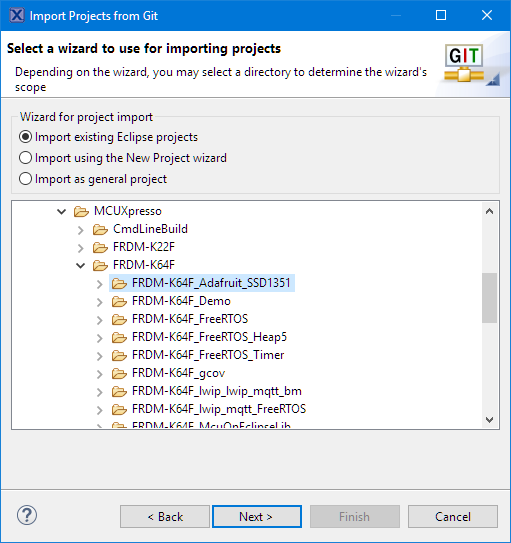 It depends on the plug-ins, but the files in this folder store the per-project user preferences, and sometimes include paths to local files. Putting these files in the repository makes life miserable to other team members, especially if they use different platforms (Windows/Mac/Linux). And even if these files do not include paths, being user preferences, might not match other users preferences. Ok, good information! It seems I was right with ignoring the .settings directory in the past. I’ll add a note to the article. Ok. Just that the files are not XMLs, but Java preferences (simple name=value lines). The Indexer settings, like include paths and macros, can be a long list. They did not seem to get stored as part of the project settings. I found them in my workspace, but apparently you can also store them as part of the .settings. In that case it would be useful to reuse those settings between developers/clones, and put it in git. I haven’t fully figured this out yet though. I was surprised this didn’t work as expected out of the box. 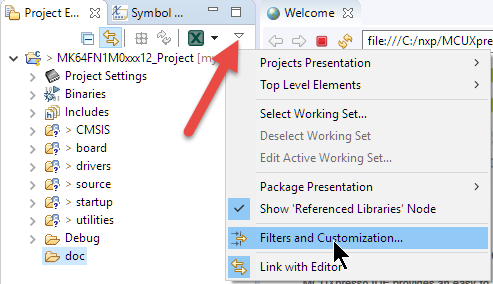 The include paths and all the other projects settings are in the .cproject file, see https://mcuoneclipse.com/2013/03/29/version-control-with-processor-expert-projects/. Not entirely it seems. For the Indexer to work, I needed to set the project settings -> C/C++ General -> “Preprocessor Include Paths and Macros etc”. These did not end up in the project settings but in the workspace .metadata. So a second clone, or other developer, did not have this long list of required settings. This was/is still the unexpected part. 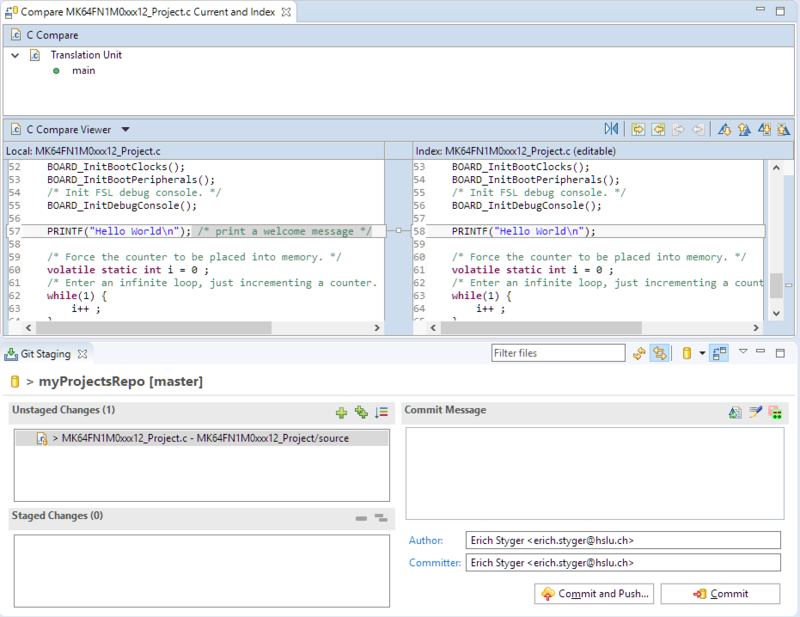 In Eclipse [Photon Release (4.8.0)] there appear to be _two_ configuration items for include paths,etc (?). Not clear what the difference is, and the impact on the Indexer. I’ll see if I can play around with it a bit. Perhaps they end up in different config files. These two configuration settings are typically populated by the CDT build plugin (project settings > C/C++ Build > Settings) and do not need to be configured, at least to my knowledge. Or in other words: the include path settings and the preprocessor macros shown there are coming from the build tool settings (compiler, assembler). 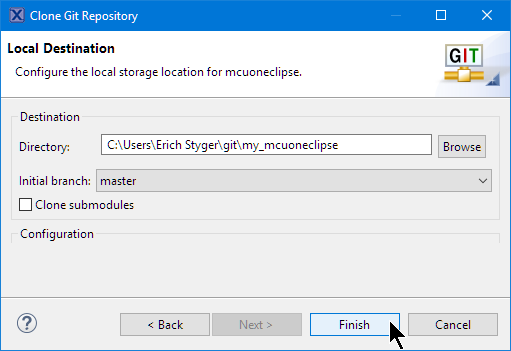 When you have an external makefile project, I believe you need to modify the Indexer settings (see also https://mcuoneclipse.com/2017/07/22/tutorial-makefile-projects-with-eclipse/). Unless there’s an Eclipse feature I don’t know about. Will investigate some more. Another great git GUI that I’ve recently found and like is Git Extensions: https://github.com/gitextensions/gitextensions. It’s very much no-frills, function over form, and gets the job done. I didn’t like the idea of having to register and “integrate” with Atlassian just to manage projects which have no interaction whatsoever with Bitbucket in the case of Sourcetree (assuming I didn’t mess up during the install and bring that on myself). 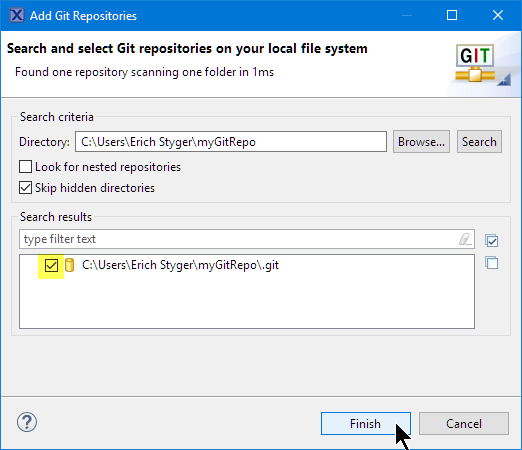 Git Extensions is the best standalone, free license alternative I’ve found. Thank your for that link, this is indeed an interesting alteratnive. I did not like that Atlassion registration too, and the constant updates which seem to cause some problems on my end too.